Kids Math is a game based app developed for young children to enhance their skills in mathematics each game is designed to help the child in the key areas of attention, coordination, memory, perception and reasoning. 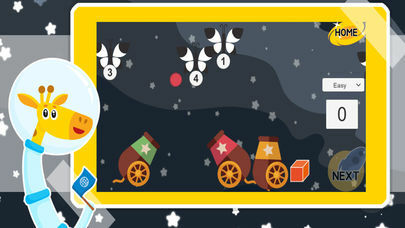 Interesting graphics and background music let the child work their way through the games across three different levels. The in app purchase provides an assessment and review for all the games and stops the adverts. The application is downloaded after permission to access the in app purchases and the device microphone, with no fuss and takes up a meagre 21MB of space on the Android device I was using. 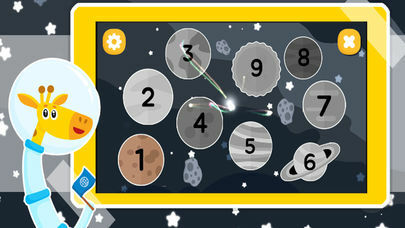 The splash screen presents you with a moving animation of a giraffe and frog astronauts flying in space above a yellow moon with shooting stars. A tap reveals another screen with nine planets which are numbered a settings button on the top left of the screen and an exit cross on the top right of the screen. The settings screen presents you with a choice of eight language settings and an icon for muting the background music. Back on the planet scene and as a start the user can only select the first planet. Selecting the first planet scene reveals another screen that presents the user with a choice of six games. 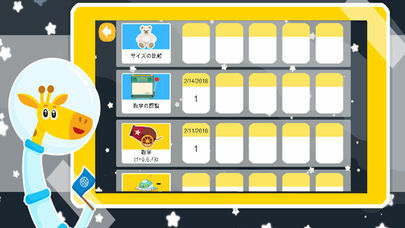 The first game is entitled “Recognition of Order” clicking this screen presents the user with a summary of the aspects of the skills that the child will develop, this is common to each game but the particular skills are highlighted for individual games. This particular game indicates that ‘Attention”, “Coordination”, “Memory” and “Perception” will be practiced. The remaining two skills of Maths and Reasoning are not highlighted but show. At this stage the child can choose the difficulty level from ‘easy’, to ‘intermediate’ through to ‘difficult’. Once chosen another screen appears which gives the child an indication of how to play the game. In this game the idea is to catch the correct fruit that is shot out from the left side of the screen to a moving icon set of fruit with a blank box that accommodates the correctly sequenced fruit. The wrong fruit colliding with the icon set scores the child zero so they have to be careful to move the set out of the way until the correct fruit fires out. The child has a score up to 15 but can continue on if the enjoy the game. The lead up procedure is generic for each game. The remaining games are “Compare the Numbers” which identify Numbers in Mathematics skills, coordination and perception. The idea is to pop the balloons to make both sides equal. The next game is called “Numbers” which identify Numbers in the Mathematics skills and perception. The idea of the game is to count the number of balls and subsequently choose from a set of numbers displayed along the bottom of the screen. The next game is called “Mole” and this will test the skills of attention, coordination and memory. The idea of the game is to tap on the mole that corresponds to the spotted grid on the left of the screen which helpfully identifies the position of the moles. The next game is called “Subtraction” and this will test Subtraction in the Mathematics skill section as well as attention, coordination and perception skills. The idea is to count the blocks and work out how may of these are taken away to provide the correct answer. The final game is “Addition” and obviously it ticks the Addition skill in the Mathematics skill box along with attention, coordination and perception skills. Again the child has to count the number of blocks up and provide the answer as the blocks stack up in the answer section. When the user decides to go for the “in app” purchase they have an additional 7 games to play. These are as follows: ‘Compare Sizes’, ‘Recognition of Numbers’, ‘Numbers (b)’, ‘Subtraction (b)’, ‘Addition (b)’ ‘Tetrominoes’ and ‘Recognition of Order’. Of special mention are the two games Recognition of Numbers and Tetronominoes. The recognition of numbers game is a fruit machine that displays various numbers in both icon and number that have to be matched. 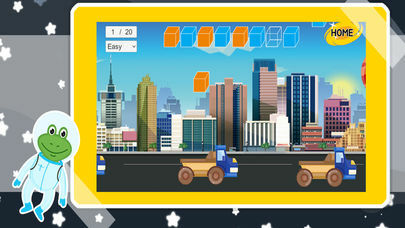 The tetrominoes game is a clever use of a grid similar to tetris where the first screen displays the layout of squares and the second screen is the screen for the child to place the shapes to match the first screen, these shapes can be rotated to provide the child with some customization to match shapes. I enjoyed playing the games and the layout and graphics enhance the gameplay. The games could very easily become very engaging and drive the child onto the highest levels. As the child progresses through the games they become increasingly competent at the mathematical concepts. The “in app” purchase also populates a dashboard that list the scores obtained by the games and the date they are completed and also removes the adverts. I am sure this app will become a useful addition to a parent or teacher portfolio of games for education and fun acting as an important set of fun games to track the progress a child is making through the mathematical concepts that the game helps them develop an understanding for. Do you wish your kids were excited about math? Kids Math is a beautifully designed new educational app for children, great for ages from 5! Even toddlers can learn numbers and simple math! Through fun puzzles and games kids will learn simple counting, addition, subtraction, multiplication, even more with geometric games too! Our effective learning courses will boost your children’s calculation speed, memory, space perception, and logic skills. All puzzles come with wonderful graphics and sounds kids will love. 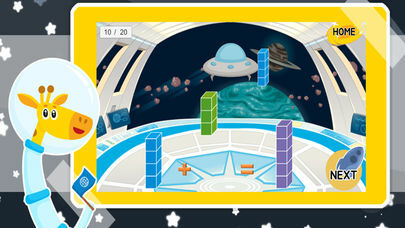 Kids Math is the perfect tool for learning and brain exercises for everyone. Yes, Everyone! Even you can have a fun play math games with your kids. Also, you can monitor their progress and raise or lower the difficulty level of the games to let your kids learn at their own pace. There is nothing more precious than watching your children grow and learn. Kids Math comes from a team that has been working in education for the last 20 years, so you can trust that we know exactly what our children need to learn and how to create effective and productive learning courses for our kids. Kids Math is a perfect application for a lifetime of learning. 1. Covers wide age groups from 5. From Preschoolers to K-3 kids. Math learning through an interesting game. - Including nine stages, 14 games for each stage. 2. The principle of mathematics with games. Easy to understand. - The fundamental arithmetic operations (addition, subtraction, multiplication). 3. Effective for developing intelligence.